Wisdom comes with experience, and the sad part is, often the experience of others simply won't do. You have to make your own mistakes to properly learn some lessons. 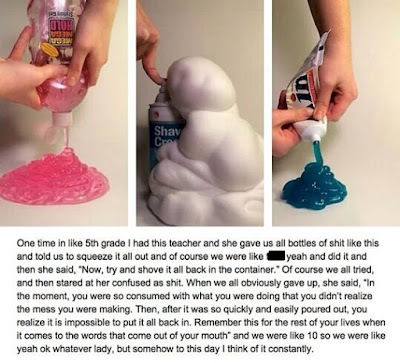 Nevertheless, it's a teacher's job to try, and on occasion, they'll find great ways to illustrate things that stick with us for the rest of our lives. One Reddit user (since deleted) remembered a lesson that stuck with him—of course, it could probably use an update to comment on what we say on social media rather than just what we say aloud, but the core is decidedly good advice. Better to take it than gain wisdom the hard way.